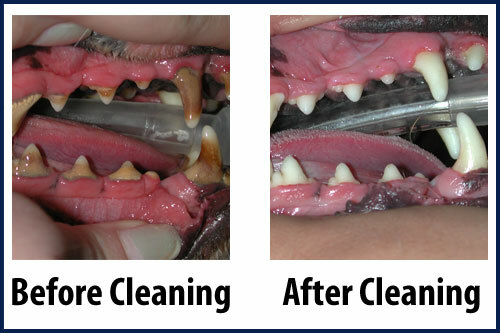 WHY IS IT IMPORTANT FOR PETS TO HAVE CLEAN TEETH? 1. ELIMINATES BAD BREATH: Encouraging more cuddles, snuggles and kisses. 2. REDUCES LONG TERM HEALTH PROBLEMS: By eliminating plaque, dangerous bacteria are removed. These bacteria attack heart kidney and liver, and is the main cause of many systemic diseases. 3. ELIMINATES PAIN: When tartar spreads under the gum line, it begins to destroy bone and supporting tissues around the teeth. This causes pain and discomfort effecting eating habits, which may result in weight loss, depression. 4. IMPROVES QUALITY OF LIFE: All together eliminating bad breath, reducing pain and preventing health problems allows your pet to live a longer happier life to play with you and love you longer. ENCOURAGES A LONGER, HEALTHIER LIFE AND MINIMIZES THE CHANCE OF LONG TERM VETERINARY COSTS ASSOCIATED WITH DENTAL RELATED HEALTH ISSUES.